Pregnant Kate Middleton Goes Back to School in Navy Shift Dress: See Her Growing Baby Bump! Kate Middleton has kept a low profile since her well-coated appearance on Christmas Day. 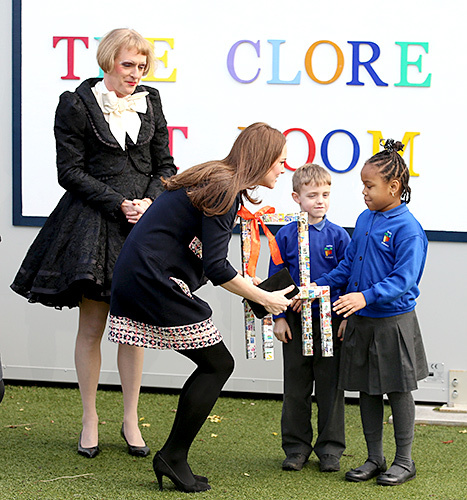 But on Thursday, Jan. 15, the pregnant Duchess of Cambridge finally stepped out again, this time to officially name the just-launched Clore Art Room at the Barlby School in West London. To christen the latest Art Room, Prince William&apos;s wife, 33, donned a navy Madderson London dress embellished with pink tweed pocket covers and a hem. The design&apos;s fitted cut allowed her baby bump to peek through—at six months along, we can truly see it now! The children at Barlby Primary have created this colourful banner to welcome The Duchess of Cambridge to their school. Her Royal Highness will shortly officially name the Clore Art Room. To accessorize the ensemble, the royal bundled up in opaque tights, also adding suede platform heels, a silver watch, and her beloved sapphire earrings. As a royal patron of The Art Room, Middleton was on hand not only to open the facility, but also to join in a roundtable discussion with teachers, counselors, and more education professionals on the importance of art therapy in schools. She then met with the children of the Room&apos;s Barlby School, as well as the nearby Oxford Gardens Primary School, to talk to them about their artwork. The mom to Prince George, 17 months, had been scheduled to open the Clore Art Room last October, but her severe morning sickness at the time kept her from all royal engagements. However, her health has much improved since then, so she&apos;s returned to her royal duties. She even celebrated her 33rd birthday on Jan. 9 in style, albeit with a low-key affair at the palace.